Famous French writer Honore de Balzac (1799-1850) had a “vague dread” of being photographed; the above daguerrotype by Nadar is the only photographic print we have of him. Like some primitive peoples, and cranky autocrats, Balzac thought the camera steals a part of the soul. Balzac told a friend “every body in its natural state is made up of a series of ghostly images superimposed in layers to infinity, wrapped in infinitesimal films.” Each time a photograph was made, he believed, a layer would be stripped off to become not life as before but a membrane of memory in a sort of translucent antiworld. What a curious notion indeed. If only he were half as concerned about his daily food intake as he was with photos. 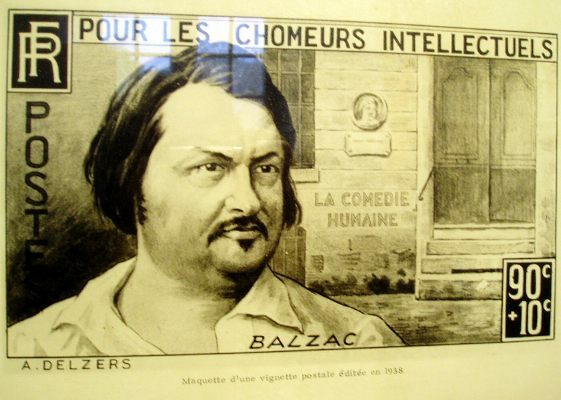 During his all too frequent creative bouts, Balzac would lock himself away, only drinking coffee and eating fruit. When he finally took a break, he would consume huge quantities of food. One record noted that Balzac ate “a hundred Ostend oysters, twelve cutlets of salt-meadow mutton, a duck with turnips, two partridges and a Normandy sole,” at one sitting, not to mention the desserts, fruit and liqueurs. A very minor, almost OT tangent: is it me, or Balzac’ hand seems disproportionally small compared to his head? I know all contemporaries talked about his “lion” head (or “ugly gigantic” head) – still, his hand is too child-looking for his body. He looks like a conservative…sounds like one, too. Balzac is the greatest of French writers. No one is even close. Camus ? Whats this about Garfman ? yes I knew Harry and also knew Steve D’ Inzillo local 306 what of it…. ?